For other uses, see Dawn (disambiguation). Dawn is sometimes considered the beginning of morning twilight (as depicted here), sometimes the period of twilight, and sometimes the time of sunrise. Dawn, from an Old English verb dagian: "to become day", is the time that marks the beginning of twilight before sunrise. It is recognized by the appearance of indirect sunlight being scattered in the atmosphere, when the centre of the Sun's disc reaches 18° below the horizon. This dawn twilight period will last until sunrise (when the Sun's upper limb breaks the horizon), as the diffused light becomes direct sunlight. Dawn begins with the first sight of lightness in the morning, and continues until the sun breaks the horizon. This morning twilight before sunrise, is divided into three categories depending on the amount of sunlight that is present in the sky, which is determined by the angular distance of the centre of the Sun (degrees below the horizon) in the morning. The categories are named: astronomical, nautical, and civil dawn. Astronomical twilight begins when the sky is no longer completely dark after astronomical dawn. This occurs when the Sun is 18 degrees below the horizon in the morning. At this point a very small portion of the sun's rays illuminate the sky and the fainter stars begin to disappear. Astronomical dawn is often indistinguishable from night, especially in areas with light pollution. Astronomical dawn marks the beginning of astronomical twilight, which lasts until nautical dawn. Nautical twilight begins when there is enough illumination for sailors to distinguish the horizon at sea but the sky is too dark to perform outdoor activities (except with artificial light). Formally, nautical twilight begins when the Sun is 12 degrees below the horizon in the morning. The sky becomes light enough to clearly distinguish it from land and water. Nautical dawn marks the start of nautical twilight, which lasts until civil dawn. Civil twilight begins when there is enough light for most objects to be distinguishable, so that some outdoor activities, but not all, can commence. Formally, civil dawn occurs when the Sun is 6 degrees below the horizon in the morning. If the sky is clear, it is blue colored, and if there is some cloud or haze, there can be bronze, orange and yellow colours. Some bright stars and planets such as Venus and Jupiter are visible to the naked eye at civil dawn. This moment marks the start of civil twilight, which lasts until sunrise. The duration of the twilight period (e.g. between astronomical dawn and sunrise) varies greatly depending on the observer's latitude: from a little over 70 minutes at the Equator, to many hours in the polar regions. 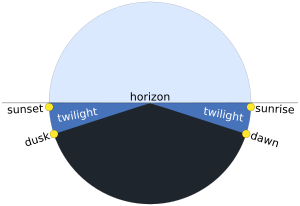 The period of twilight is shortest at the Equator, where the equinox Sun rises due east and sets due west, at a right angle to the horizon. 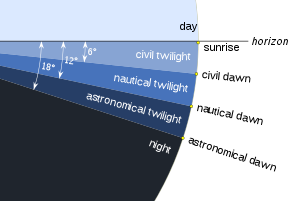 Each stage of twilight (civil, nautical, and astronomical) lasts only 24 minutes. From anywhere on Earth, the twilight period is shortest around the equinoxes and longest on the solstices. Daytime becomes longer as the summer solstice approaches, while nighttime gets longer as the winter solstice approaches. This can have a potential impact on the times and durations of dawn and dusk. This effect is more pronounced closer to the poles, where the Sun rises at the vernal equinox and sets at the autumn equinox, with a long period of twilight, lasting for a few weeks. The polar circle (at 66°34′ north or south) is defined as the lowest latitude at which the Sun does not set at the summer solstice. Therefore, the angular radius of the polar circle is equal to the angle between Earth's equatorial plane and the ecliptic plane. This period of time with no sunset lengthens closer to the pole. Near the summer solstice, latitudes higher than 54°34′ get no darker than nautical twilight; the "darkness of the night" varies greatly at these latitudes. At latitudes higher than about 60°34, summer nights get no darker than civil twilight. This period of "bright nights" is longer at higher latitudes. Around the summer solstice, Glasgow, Scotland at 55°51′ N, and Copenhagen, Denmark at 55°40′ N, get a few hours of "night feeling". Oslo, Norway at 59°56′ N, and Stockholm, Sweden at 59°19′ N, seem very bright when the Sun is below the horizon. When the sun gets 9.0 to 9.5 degrees below the horizon (at summer solstice this is at latitudes 57°30′–57°00′), the zenith gets dark even on cloud-free nights (if there is no full moon), and even the brightest stars are clearly visible in a large majority of the sky. Many Indo-European mythologies have a dawn goddess, separate from the male Solar deity, her name deriving from PIE *h2ausos-, derivations of which include Greek Eos, Roman Aurora and Indian Ushas. Also related is Lithuanian Aušrinė, and possibly a Germanic *Austrōn- (whence the term Easter). In Sioux mythology, Anpao is an entity with two faces. The Hindu dawn deity Ushas is female, whereas Surya, the Sun, and Aruṇa, the Sun's charioteer, are male. Ushas is one of the most prominent Rigvedic deities. The time of dawn is also referred to as the Brahmamuhurtham (Brahma is god of creation and muhurtham is a Hindu unit of time), and is considered an ideal time to perform spiritual activities, including meditation and yoga. In some parts of India, both Usha and Pratyusha (dusk) are worshiped along with the Sun during the festival of Chhath. Prime is the fixed time of prayer of the traditional Divine Office (Canonical Hours) in Christian liturgy, said at the first hour of daylight. In Islam, astronomical dawn (Arabic fajr) is the time of the first prayer of the day, and the beginning of the daily fast during Ramadan. In Judaism, the question of how to calculate dawn (Hebrew Alos/Alot HaShachar, or Alos/Alot) is posed by the Talmud, as it has many ramifications for Jewish law (such as the possible start time for certain daytime commandments, like prayer). The simple reading of the Talmud is that dawn takes place 72 minutes before sunrise. Others, including the Vilna Gaon, have the understanding that the Talmud's timeframe for dawn was referring specifically to an equinox day in Mesopotamia, and is therefore teaching that dawn should be calculated daily as commencing when the sun is 16.1 degrees below the horizon. The longstanding practice among most Sephardic Jews is to follow the first opinion, while many Ashkenazi Jews follow the latter view. ^ "The different types of twilight". ^ Van Flandern, T.; K. Pulkkinen (1980). "Low precision formulae for planetary positions". Astrophysical Journal Supplement Series. 31 (3): 391. Bibcode:1979ApJS...41..391V. doi:10.1086/190623. ^ a b c National Oceanic and Atmospheric Administration. "Astronomical Terms". ^ "New Dawn at La Silla". ESO Picture of the Week. European Southern Observatory. Retrieved 27 February 2015. ^ Nihus, Barthold (1642). Epigrammata disticha. Johannes Kinckius. Wikimedia Commons has media related to Sunrises.